Sean Kelly announces Bodyspace, an exhibition of new work by Antony Gormley. 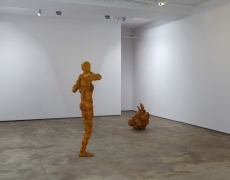 Bodyspace is the inaugural solo exhibition at Sean Kelly’s new location at 475 Tenth Avenue. 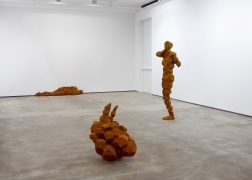 This is the first opportunity to see new work by Antony Gormley in New York since his acclaimed Event Horizon installation in and around Madison Square Park in 2010. 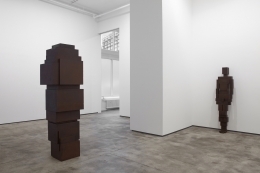 Bodyspace expands Gormley’s investigation into the polarizing effects of mass and energy through the installation of two new works in the gallery’s main exhibition space. Shore II, which comprises a 9.3-ton monolithic iron block and a crouched body formed of smaller blocks positioned against it, explores the relationship of the body to architecture. 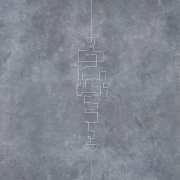 The intense solidity of Shore II is countered by Signal, a sculpture from Gormley’s Liner series, works he considers to be drawings in space. This straight 6-millimeter mild steel line becomes a twisting helix as it maps the inner space of a prone body, referencing the connective structures of electricity and implying a transmission that passes from body to city. In its reduced but rigorous geometry of 90-degree bends, the work both utilizes and escapes from the grid. 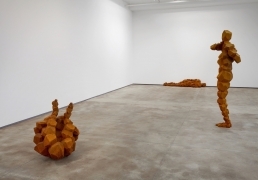 As Gormley states, “Both works on exhibit are catalysts for proprioceptive awareness, rendering the volumes of the new Sean Kelly gallery into a reflexive chamber in which the viewers’ passage through space and confrontation with mass is activated and registered.” In their juxtaposition, Shore II and Signal illucidate the dynamic relationships created between the sculptures, the viewer and the exhibition space; it is particularly significant in this context given that these works are the first to be shown in the gallery’s new location. 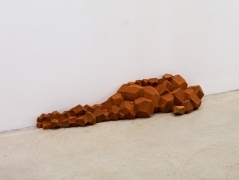 Additional new sculptures by Gormley concerned with the central themes of his practice will be installed in the gallery’s project space on the first floor as well as the gallery space on the lower level. Timed to coincide with Bodyspace, Gormley’s Extend will be installed on the grounds of the British Ambassador’s residence in Washington, DC in recognition of the 50th anniversary of the Art in Embassies program. 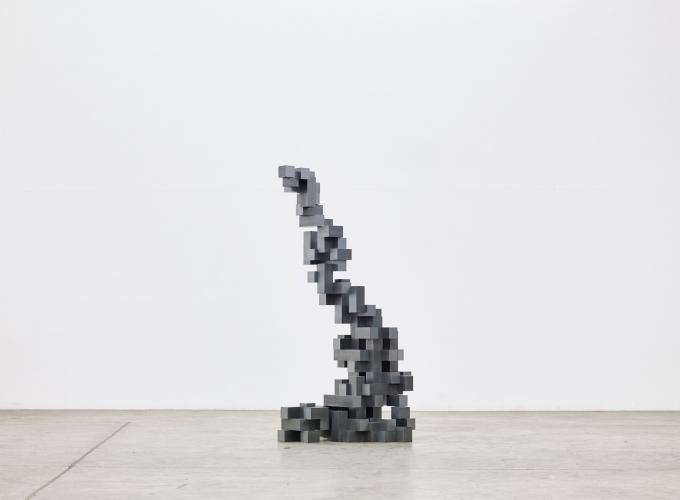 Antony Gormley’s work is included in numerous public collections worldwide including: the Tate, London; the Centre Georges Pompidou, Paris; the National Museum of Modern Art, Tokyo; the Museum of Contemporary Art, Los Angeles; the Walker Art Center, Minneapolis; the Denver Art Museum, Denver; and the Nasher Sculpture Center, Dallas. Major permament works and other public projects include Angel of the North, Gateshead; Another Place, Crosby Beach, Liverpool; Habitat, Anchorage, Alaska; Horizon Field, Vorarlberg; the aforementioned Event Horizon, New York, as well as the One & Other commission in London's Trafalgar Square. His recent major solo exhibitions have included Horizon Field Hamburg, Deichtorhallen Hamburg; Still Being– Corpos Presentes, CCBB Brazil; Still Standing, The State Hermitage Museum, St. Petersburg, and Drawing Space,The Phillips Collection, Washington, DC. Gormley was awarded the Turner Prize in 1994 and the South Bank Prize for Visual Art in 1999 and was made an Officer of the British Empire (OBE) in 1997. He is an Honorary Fellow of the Royal Institute of British Architects, Trinity College, Cambridge and Jesus College, Cambridge and has been a Royal Academician since 2003. Acclaimed architect Toshiko Mori designed Sean Kelly’s new 22,000 sq. ft. gallery space at 475 Tenth Avenue (at 36th street). The two-story gallery is located in an historic 1914 building and is the first of its kind in the rapidly developing Hudson Yards neighborhood. The new space includes 16-foot ceilings, a main gallery featuring 2,900 sq. ft. of exhibition space, as well as additional project spaces and a black-box theater.